As time progresses technology advances. The technology tree grows and as ideas come to fruition and commodity takes hold, ubiquity increases as time continues on. This post intends on look at the cyclical nature of change and how it can impact the way we operate. Innovation is to introduce new ideas; original and creative in thinking. They could also be something that is a new method, product, or idea. The innate ability to innovate requires visionary and a strong notion of originality. To be born with the natural ability to conceive an idea which achieves ubiquity is rare. There are certain stages in which innovation passes through. As this cycle continues along throughout time and as ubiquity increases customisation occurs. Customisation allows the product to be tailored to meet certain needs an idea, method or concept grows. As it penetrates its intended market it becomes commoditized in a way that it exists in high volume or a mandated process. As innovation is conceived to address a customer need or a predicted market. This overlays well with the innovation adaptation life-cycle. 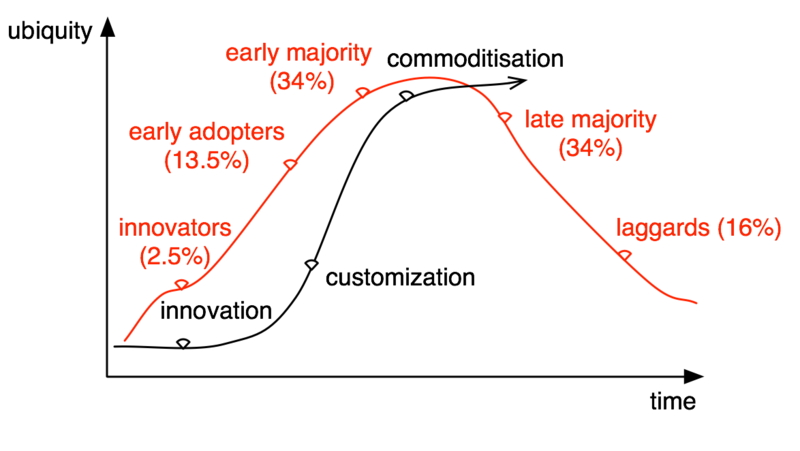 This life cycle looks at the percentage of the market and how early on the scope of the market is narrow but as innovation gives way to customisation purchase is gained. 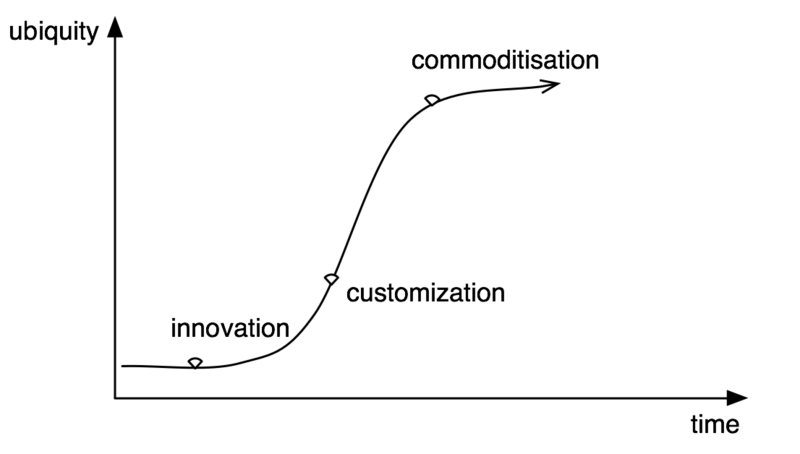 It is when customisation and variation lead to commoditization does the market share rise substantially. Eventually as the technology declines from critical mass do the late majority climb aboard. Laggards then follow and such an example would be those who are now migrating from Windows XP. Now this is a logical progression but how does Disruptive change occur and where does it occur? 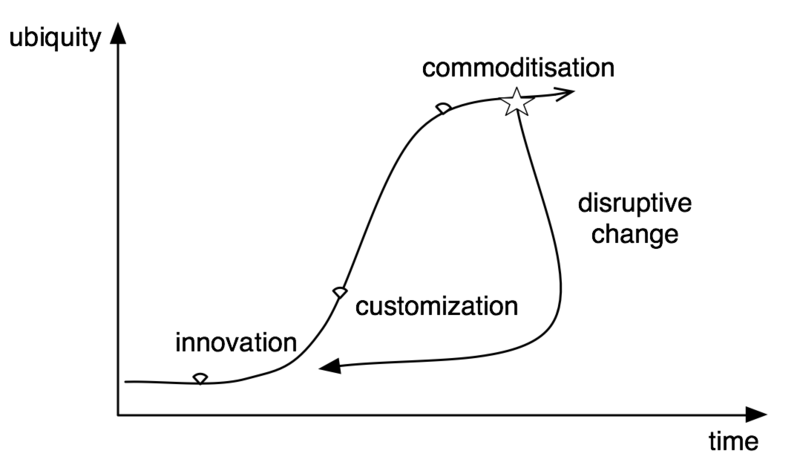 When the innovation is commoditized and is available to the masses the ability for disruptive change is high. Take the mobile phone as an example. Whilst it was innovative early on the high cost and prohibitive nature of carrier contracts were roadblocks. As customisation such as handset cost, GSM, or inbuilt antenna was scoped and rolled out did the innovation to early majority bridge crossed. It was only when it became a commodity did disruptive change occur. A large fruit company decided to add touch. By adding touch to a phone, this company was able to change the use case for mobile phones. This change was a disruptive change with led to new innovation. Thus the cycle again began. The iPhone is an example of continuous disruptive change. App store would be the next example taking a commoditized item and applying a totally new use case. Our industry is cyclical. Every process everywhere is cyclical. The future we see now has come before. As we are seeing it rehashed before our eyes, harken back to mainframe computing. Very analogous to virtualization of x86 hardware? Look at what you can do now with commodity server hardware (openstack) or silicon (arise from the grave Broadcom). You do not need to be an innovator to be innovative – you just need to remember that it is important to think outside the box. As time increases and the ubiquity rises unpredictable changes lead to disruptive innovation.